There’s nothing like making homemade takeout… you know those staples like pizza, burgers, Mexican and probably one of the most popular Chinese. I don’t know about you but one of the things I like the most from my Chinese take-out are the egg rolls. And today I am bringing you a super simple and absolutely delicious recipe to making egg rolls at home! First, in a medium bowl, I combined shredded chicken (I bought a cooked rotisserie chicken from the supermarket), broccoli slaw (which you can find in your local supermarket in the bagged salad area), cilantro, scallions, and freshly grated ginger along with teriyaki sauce, duck sauce and vegetable oil. Next, with the egg roll wrapper positioned in a diamond shape in front of me I placed about two tablespoons of the mixture in the lower corner. To roll, I folded up the bottom corner, then each of the sides (it’ll look like an envelope) and then dabbed the top edges with water and then rolled to enclose it. Once I had finished rolling all of the egg rolls I heated vegetable oil in my cast iron skillet. I’ll say it was about 1/4 of the way up the sides of my skillet. Now, I’m not one to take the temperature of the oil when frying food. My trick, place a wooden spoon in the center of the oil and if bubbles form around it you know the oil is ready. This is definitely a lot safer than my other “trick,” flicking water into the oil. Not a lot of course, just enough to get a reaction. 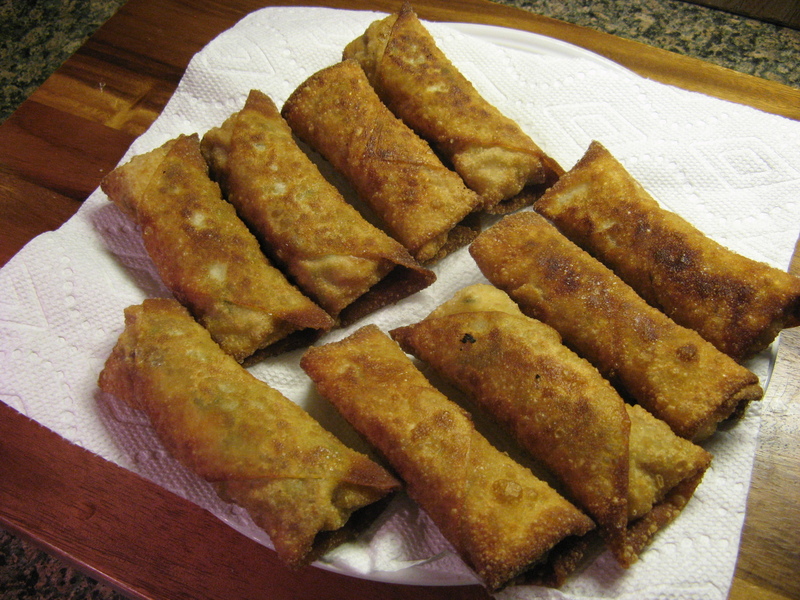 So, once my oil was ready I fried the egg rolls in batches, turning, about 3-4 minutes until they were golden brown. I then transferred them to a paper towel-lined plate to drain. 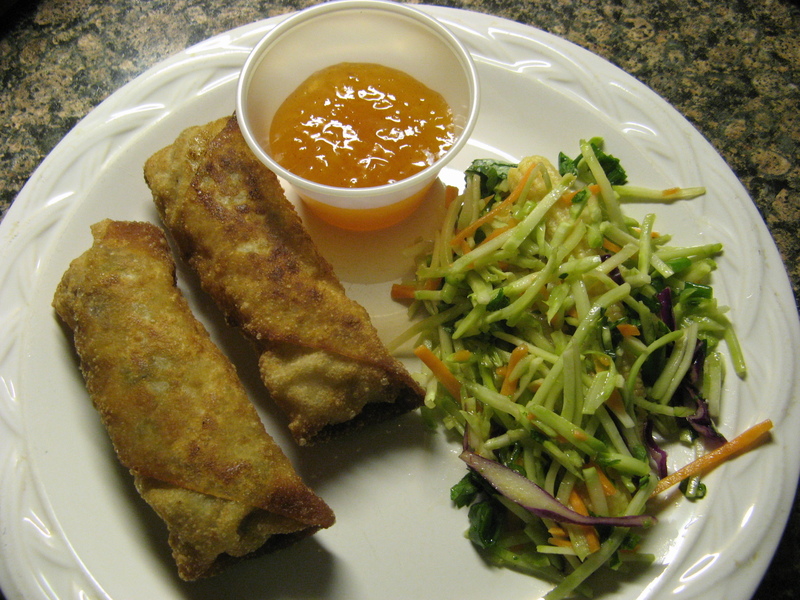 I served the egg rolls with a broccoli slaw salad made by combining the remaining broccoli slaw, cilantro and scallions in a large bowl and tossing it with teriyaki sauce, duck sauce, vegetable oil and rice vinegar. And of course with a side of duck sauce for dipping! YUM! The fresh grated ginger is really the standout ingredient in these egg rolls… You taste it, but, not as an overpowering ingredient but as one that really brings all the flavors together. And it wasn’t long before I made these again (less than a week later) but without the chicken, yet, they were just as delicious. I am thinking of trying shrimp next. 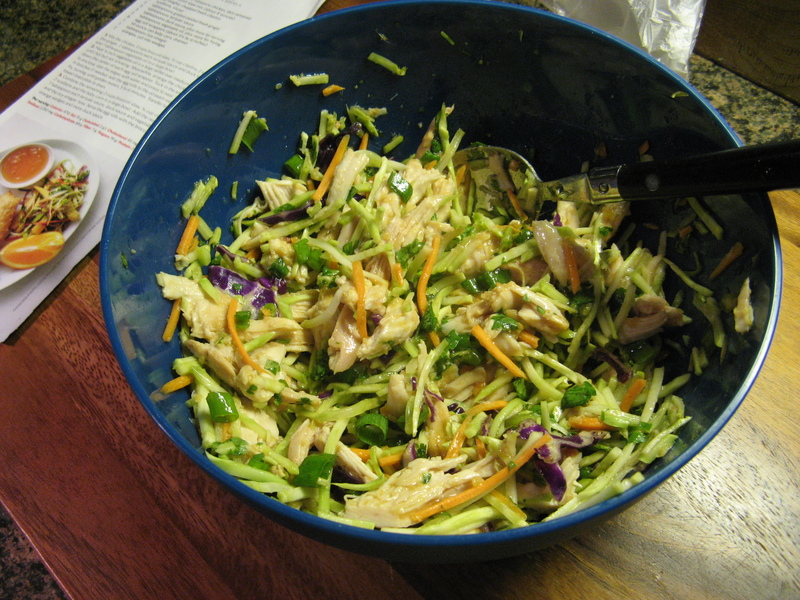 Mix the chicken, 2 cups broccoli slaw, 1/4 cup cilantro, 2 scallions, the ginger, 2 tablespoons each of teriyaki sauce and duck sauce and 1 tablespoon of vegetable oil in a medium bowl. Heat about 1/4 inch of vegetable oil in a large skillet over medium-high heat until the oil is hot but not smoking. 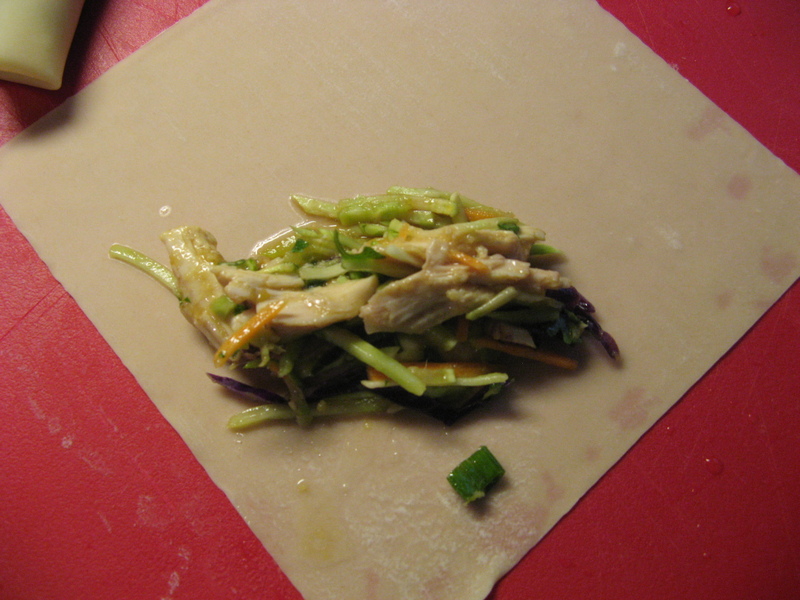 While the oil is heating, arrange the chicken mixture in the center of each egg roll wrapper. 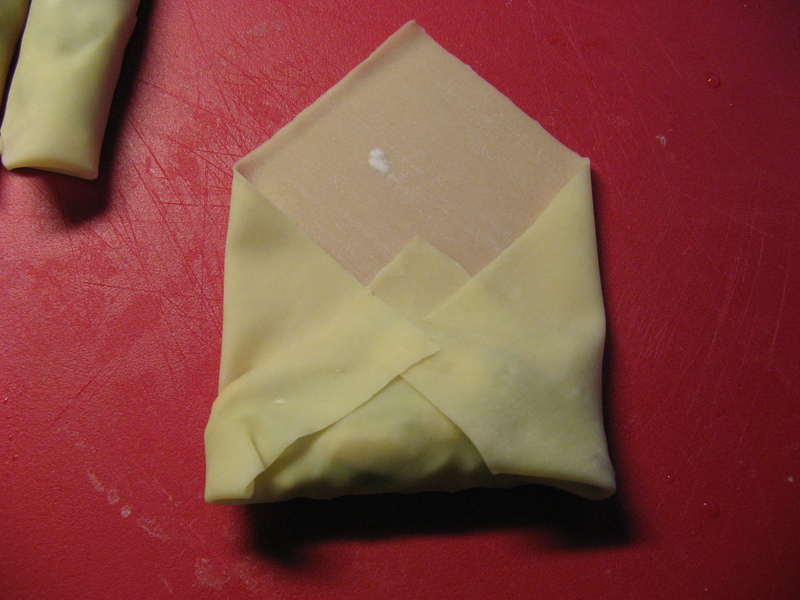 Tuck in the ends and roll to enclose, dab the edges with water and continue to roll to enclose. Once the oil is hot, fry the egg rolls in batches, turning, 3 to 4 minutes. Transfer to a paper towel-lined plate to drain. To make the slaw, combine the remaining broccoli slaw, cilantro and scallions in a large bowl. Add the remaining tablespoon each of teriyaki sauce, duck sauce and vegetable oil along with the rice vinegar, toss. Serve with the egg rolls. **The original broccoli slaw recipe included a 14-ounce can of baby corn which I opted to leave out. These look great, Frances!! I love the filling.